Since I ate three of those stinking cupcakes yesterday, I needed to make something for dinner that was somewhat low in calorie and weight friendly. So I decided on these. And I love how super simple they are. Cut up your veggies and your chicken sausage put them on a stick, then throw them on a grill. How much easier can you get? Plus everything was so yummy! I used a charcoal grill, because I love the flavor it infuses into the food, but the sausage already has so much flavor that you don’t need it for this dish to taste amazing. And the couscous gives such a refreshing yummy flavor that goes great with the skewers. One thing I would recommend though, this recipe has a lot of things going on all at once. So, to avoid trying to read directions, running around your kitchen, and at the same time trying not to burn your food, read through the directions before you start. Me personally, the pesto sauce was the first thing I ended up making. It just didn’t make much since to make it in the heat of trying to cook everything else. Plus, if I’m outside trying to cook on the grill, I’m also trying to keep my two year old away from it so he doesn’t get burned and watching my dogs so they don’t sneak samples of my food. Yeah, the sauce was not getting fit in right then. So figure out what works for you and execute your own plan. Other then that, I was totally impressed with this recipe!! So super yummy and definitely worth the time! Soak eight 8-inch wooden skewers in water at least 15 minutes. Preheat a grill or grill pan to medium high (or light charcoal). Prepare the couscous as the label directs. Meanwhile, toss the bell peppers, sausage, onion and tomatoes in a bowl with 1 tablespoon olive oil; season with salt and pepper. I didn’t end up tossing my sausage in with the veggies because they were so soft I was afraid of them falling apart. I don’t know if it was the brand I got, but if this be the case with you also, then just season it separately. Thread onto the skewers, alternating the sausage and vegetables. Grill, turing, until the vegetables are slightly softened and the sausage begins to brown, 6 to 7 minutes. Meanwhile, puree the parsley, cilantro and scallions in a blender with the remaining 2 tablespoons olive oil, the vinegar and 2 tablespoons water. Season with salt and pepper. 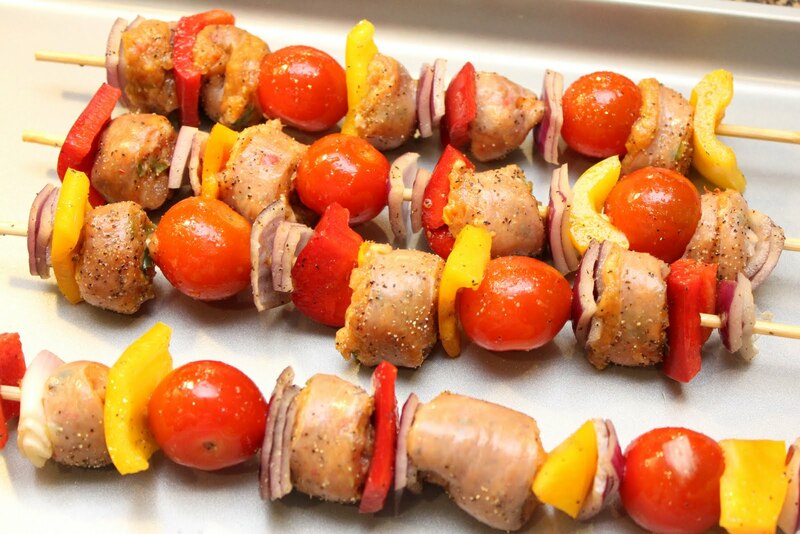 Brush the skewers with some of the pesto and continue to cook, turning, until the tomatoes are tender and the sausage is charred, 6 to 7 more minutes. Toss the couscous with half of the remaining pesto and season with salt and pepper. 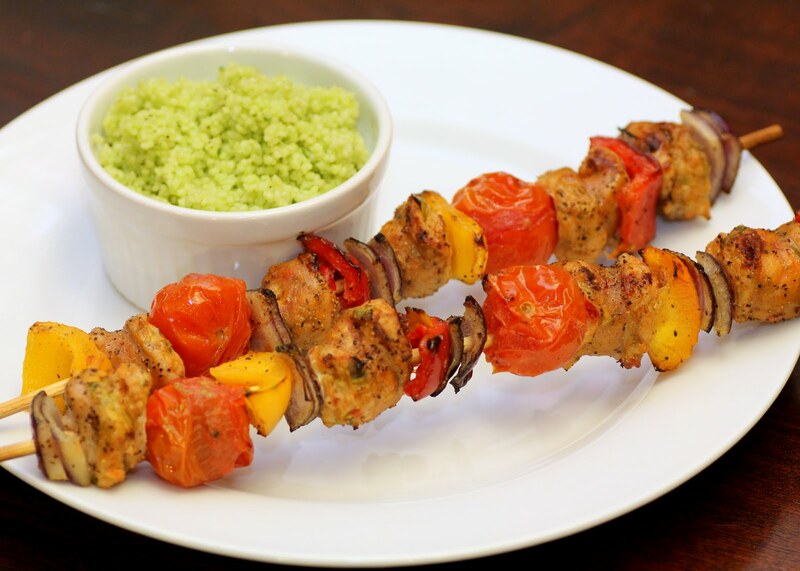 Serve with skewers and the remaining pesto, for dipping.